Please join us for an upcoming webinar from Google and The Wharton School, partners on the Fast.Forward. initiative. Prof. David Reibstein, Marketing at The Wharton School, will discuss lessons learned from this difficult economic period and how those lessons impact and influence current and future marketing decisions. Should marketers spend more or less as we move out of the recession? Should marketers change their budget allocations? If so, how? How are CMO’s dealing with the new budget parameters and what do CFO’s think of this change? How is the bottom line being impacted? For more perspectives on the changing face of marketing, visit the Fast.Forward. channel on YouTube. Many firms decide to cut their advertising and marketing spend during recessions; the most recent recession was no different. Let's say your clients sell both and iPhone and Android application. You can now set up three campaigns, one only targeting iPhones with language specific to that application and phone, one targeting Android-based phones with language specific to those users, and a third targeting all mobile devices to drive more general traffic to your clients' websites. With Device and Carrier targeting, you can now speak to clients' potential customers even more specifically in the ad text. Does the client sell ringtones? Target mobile carriers in separate campaigns and mention the customer's phone or cell phone carrier in the ad text. Does the client sell mobile accessories? Set up campaigns focused on specific mobile devices in separate campaigns and mention the phone the customer has in the ad text. Note: If you want to target Blackberry users, you will have to set up a WAP mobile ad within your account. While there is no way to specifically target Blackberry phones right now, you can reach those users through a mobile specific ad type. Find out more about how WAP ads differ from mobile ads for Internet-capable devices. 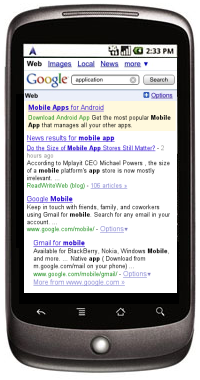 For more mobile tips and resources, visit the Google Mobile Ads site, as well as the Go Mobile! 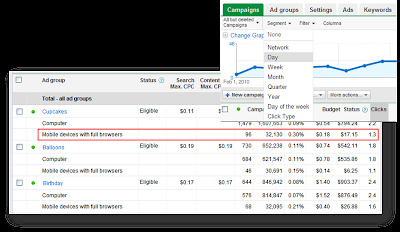 Series on the Inside AdWords Blog, and check back in a few weeks for more mobile tips to help your clients. In part two of our series on mobile ads best practices, we'll focus on carrier and device targeting. We recently launched the ability to target specific carriers and devices on mobile devices with full Internet browsers. How can this benefit you and your clients? One of the new assets of device targeting is the new automatic device targeting for applications. Now, when you are advertising an application for Android-based phones or iPhones, the ad will automatically display a "Download" link instead of a URL. hitting the market and marketers wondering how to best connect with consumers on their phones, we wanted to give you a few targeting best practices for targeting high end mobile devices.. Today we'll be giving you a few tips for optimizing mobile campaigns. While both mobile and desktop search campaigns use similar best practices, the way we search and browse the web on our mobile phones is slightly different than on our computers. Separating mobile and desktop campaigns and optimizing for performance on each platform will drive greater success for your clients intigrated marketing strategies. Use Device and Click Type reporting to figure out exactly what is and is not working in your mobile search campaigns. Just like with desktop search, you can (and should) bid according to what is sending traffic to your site and what converts best. Pulling out high performing keywords and placing them into a separate mobile campaign can help drive additional traffic in a growing market. This holds true for placements and the mobile content network as well. When running a Placement Performance Report for mobile phones, take special note of the Ad Sense for Mobile Apps category of placements (they will show up as adsenseformobileapps.com in the report). You can drill down to the specific URL and gain insight into what apps you should continue to target and which ones you should exclude. Searches on Internet-capable mobile devices average around 2.9 words (and only 2.4 on WAP phones). When expanding desktop search campaigns to mobile and/or adding new keywords to your mobile campaigns, keep in mind how people search on their phones. While desktop campaigns may benefit from "long tail", 4- to 5- word keyword phrases, you may want to consider shorter, more general, and location specific searches for mobile phones. For example, a college student in Boston may search for "Pizza near Union Square in Boston" from their dorm room, but would only search "Boston Pizza" from their mobile phones. In the past few months we've launched several mobile specific ad formats like click-to-download, click-to-call, and mobile coupons in the Local Business Center. Think about what unique advantages and messaging a mobile campaign allows and reach your customers at every point of their day. For more mobile tips and resources, visit the Google Mobile Ads site, as well as the Go Mobile! Series on the Inside AdWords Blog. With more mobile devices with full Internet browsers hitting the market and marketers wondering how to best connect with consumers on their phones, we wanted to give you a few targeting best practices for targeting high end mobile devices.. Today we'll be giving you a few tips for optimizing mobile campaigns.